Sandy Lake, a headwater lake for the Sackville River. Jack Lake, on a separate watershed; it drains into Papermill Lake (outside of the proposed Sandy Lake Regional Park) and thence to the Bedford Basin. 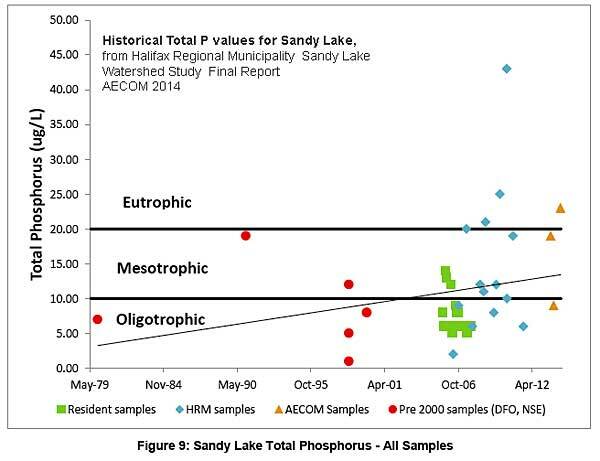 Based on Total Phosphorus measurements, Sandy Lake has moved from an oligotrophic state in 1979 towards a mesotrophic state today. EC values in the area of 30-60 uS/cm are typical of pristine lakes in the Halifax region. 6 EC values for Sandy Lake were in that range in 1955 and 1971, and 1980 (not in 1977 however) but samples taken from 1985 onward were well above 100 with an overall upward trend. The low values in 1955 and 1971 suggest the lake was likely well below the mesotrophic range (re: figure above), i.e. it was oligotrophic in those earlier years. 1. Also, pH in the range 4.5 to 5 is cited by White et.al 1981 for Sandy Lake in 1980; liming had only a transitory effect (White et.al 1981. On the feasibility of rehabilitating acidified Atlantic salmon habitat in Nova Scotia by the addition of lime. Fisheries Vol 9(1):1-3). Salmon fry are highly sensitive to ph 5.4 and below, adults to pH <5.0, but it depends on the source of acidity, tolerance being less when the acidity is derived from sulphates in acid rain than from naturally occurring humic acids. Critical pH values for brook trout are cited as pH 4.7 to 5.2. Farmer, G. Effects of low environmental pH on Atlantic salmon in Nova Scotia. 2000. Canadian Stock Assessment Research Document 2000/050. Baldigo and Lawrence 2001. Effects of stream acidification and habitat on fish populations of a North American river. Aquat.Sci.63 (2001) 196–222. 2. Ginn et al. 2007. 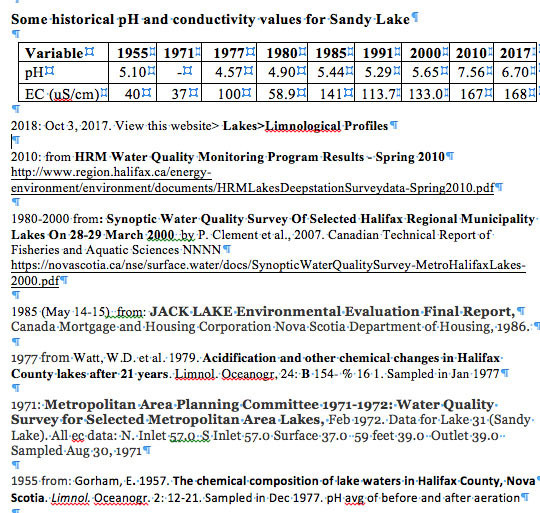 Assessing pH changes since pre-industrial times in 51 low-alkalinity lakes in Nova Scotia, Canada Can. J. Fish. Aquat. Sci. 64: 1043–1054. 3. Clair, T.A., Dennis, I.F., and Vet, R. 2011. Water chemistry and dissolved organic carbon trends in lakes from Canada’s Atlantic provinces: no recovery from acidification measured after 25 years of lake monitoring. Can. J. Fish. Aquat. Sci. 68(4): 663–674. 4. L.E. Anderson et al., 2017.Lake Recovery Through Reduced Sulfate Deposition: A New Paradigm for Drinking Water Treatment. Environ. Sci. Technol., 2017, 51 (3), pp 1414–1422. 5. Long, R.P. et al. 2009. Sugar maple growth in relation to nutrition and stress in the northeastern United States. Ecol Appl. 2009 19:1454-66. 6.Synoptic Water Quality Survey Of Selected Halifax Regional Municipality Lakes On 28-29 March 2000 by P. Clement et al. 2007. Canadian Technical Report of Fisheries and Aquatic Sciences NNNN. (i) I routinely carried a pocket conductivity meter and frequently a pocket pH meter (the latter borrowed from CBEM at St. Mary’s University), and made measurements of water on surface waters as I encountered them. (ii) On Aug 10, 2018, I paddled the perimeter of Sandy Lake and measured electrical conductivity (EC), occasionally pH at regular intervals. 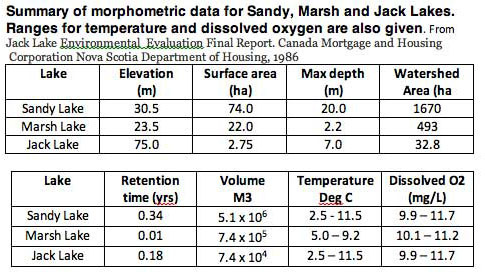 pH values for Sandy Lake were in the range 6.6 to 7.2, while EC values were mostly in the range 170 to 180. Streams on the east side of Sandy Lake had EC values in the range 30-51 uS/cm, pH 4.9 to 5.8. EC values for 2 streams on the west side were 78 and 98 uS/cm (pH 4.8, 5.4) likely reflecting some input of solutes from developments in the Gatehouse run/Lucasville Road area within the watershed. The highest stream EC and pH values were for the major inlet at the southwest corner of the lake (EC 346, 348 uS/cm pH 7.4) where Johnsonn’s Brook (sometimes known as Bob’s Brook) enter the lake. These waters receive effluent originating from the Uplands Park Wastewater Treatment Facility serving approximately 170 people, which AECOM (2014) identified as a point source of pollutants. 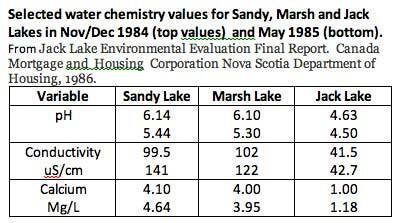 A set of water quality observations on Sandy Lake in 1991* revealed an exceptionally low pH value of 3.38 for the “Northern Inlet”. The same site sampled on Aug 21, 2017 had a pH value of 5.7. The low value in 1991 may have reflected peak acidification due to acid rain and/or exposure of acid slates in the northwestern part of the watershed (see AECOM 2014, p 8) and the higher value now observed, reductions in acid rain-causing emissions, and possibly some urban influence of now established development. (iv) A set of vertical profiles of temperature, oxygen, EC and pH were obtained for 3 sites on Sandy Lake ON Oct 3, 2017, using a Wet-pro Field kit borrowed from the Community Based Environmental Monitoring Network at St. Mary’s University. I had wanted to do these measurements in August to view summer stratification at its peak, but the equipment was not available then. Hence measurements were made on Oct 3 when the water column was likely in the process of “de-stratifying”. View Limnological Profiles for the results. So at peak stratification in 1971, the oxygen concentration at the bottom was twice the value in 2017. 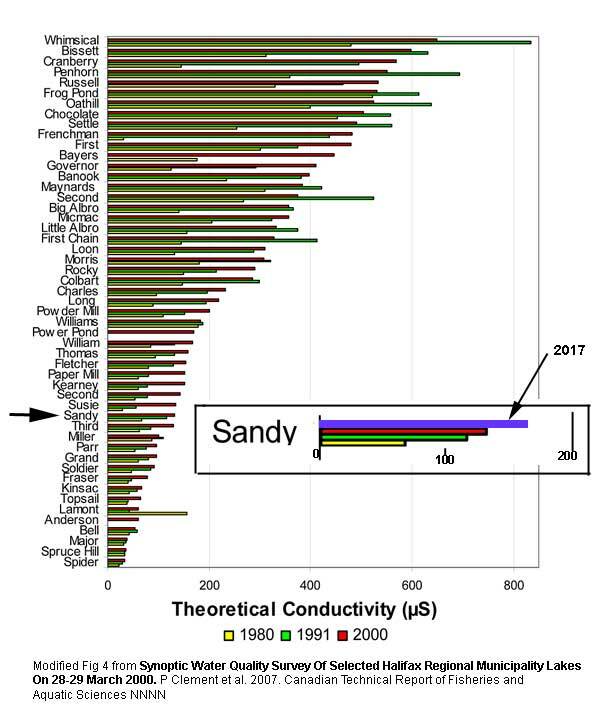 In 2018 the conductivity on the surface had increased about 4.6 fold and the bottom value was 79 uS/cm greater, compared to a difference of only 2 uS/cm in 1971. As differences in conductivity/salt content between surface and deeper water increase, they increase density stratification of water column and slow down and at some point eliminate seasonal turnover of the water column associated with temperature changes, and thus re-oxygenation of the deeper layers; in turn that can lead to permanently low or no oxygen in the deeper layers. 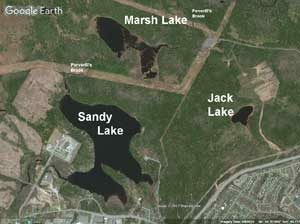 The current state of Sandy Lake and the worsening trend should be a matter of concern. While waters entering the major inlet are likely the major source of pollutants, I note also the apparent “salt signal” in streams draining land in the area of Gatehouse and Lucasville Roads; and that a large volume of clearcut debris entered the northwest side of the lake. As noted in the SLCA Response to AECOM study rising temperatures add to the stresses, e.g. by reducing oxygen solubility. AECOM has identified a number of measures to be taken to protect Sandy Lake even with further development in the watershed; stronger measures and less development were suggested by SLCA (see Recommendations in SLCA Response to AECOM study). These recent observations suggest that the lake is currently in a precarious state. The Water Quality Monitoring Functional Plan identifies Sandy Lake as a Tier I waterbody or “High Vulnerability” to be sampled with a sampling program consisting of monthly collections during the ice free season (April – December) and at least one sample during the winter season…Temperature and dissolved oxygen profiles are recommended to be collected during each sampling event at 1 m intervals with profiling intervals increased to up to 3 m below the 20 m level. Water samples should be collected from 0.5 m below the lake surface, at mid-depth, and 1 m above the lake bottom. Both discrete and volume-weighted samples from Sandy Lake are recommended to be analyzed. Total phosphorus and chlorophyll a testing must be performed on all discrete water samples. E. coli need only be measured for the 0.5 metre (top) water sample. Volume-weighted samples made up of top, middle and bottom water samples are to be tested for the remaining grouped analytical parameters specified in Table 14. The water quality monitoring program for Tier 1 lakes (Stantec 2009) is recommended as a suitably robust water quality monitoring plan for Sandy Lake that will allow for the identification of seasonal and long term patterns in water quality and to evaluate how water quality may be impacted by development in the Sandy Lake watershed. I think its clear that Sandy Lake could and probably would degrade rapidly with further significant development in the watershed. The morphometrics of Sandy Lake and the degree of development around the lake are similar to those of Williams Lake on the Halifax south mainland. At Williams Lake, there was apparently no seasonal turnover in a recent winter*, and a program of alternatives to road salt on some adjacent streets has been re-introduced. *I have to report the detailed observations on aquatic plant species in Sandy Lake. 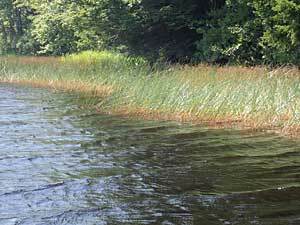 Species more characteristic of higher nutrient levels occur closer to the major inlets.